Best of Eleuthera- French Leave Restaurant update….. So I first wrote about the restaurant 1648 at French Leave in December 2014 – but I decided to do an update as well as re-present the original blog. Since opening last December the restaurant has gone from strength to strength and the great news for those of us who live here year round is that it is not closing at all throughout September and October. This is really great news as there are always a few weeks during September and October when there has been nowhere open to eat out at all – yippee ! There are now daily specials as well as the extensive menu – often a special seafood pasta, a great salad and meat dishes as well. We have been to several private functions at French Leave at they have been excellent – terrific food as well as the exceptional staff – that is one of my main reasons for deciding to do an update. Both the kitchen staff from executive chef Peter Hamm all the way down to the kitchen porters and the waiting staff are all cheerful, well trained, unfailingly polite and welcoming. A large party having fun at the hi-table …. Sous chef Merez Culmer – born right here in Eleuthera is thriving in the kitchen as is line cook and also a native Eleutheran Charles Petty. It is a delight to see them flourishing in a quality restaurant right here ! Next in the series Best of Eleuthera we look at the new restaurant called 1648 – at French Leave Harbour Village right here in Governors Harbour. We are all thrilled that we have a new place to eat out at and enjoy watching the sunsets over the water….. 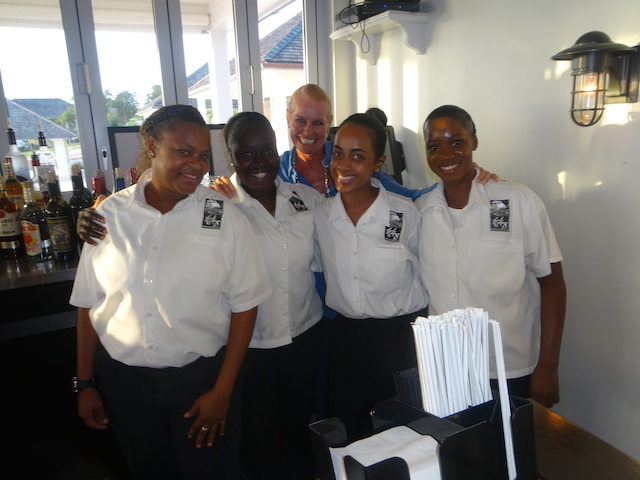 The restaurant – called 1648 Bar and Grille – is named after the year that the first settlers came to Eleuthera. It is open seven days a week. We ate there on Monday evening this week – the opening week and the food was delicious. I had lobster bisque followed by seafood risotto – they will be regulars for me to eat !! I did not take any pictures of my own food as per normal because I had devoured it before I remembered – but actually the seafood risotto does not make of a very exciting picture – however the taste was spectacular …. Interior shot of the beautifully air conditioned restaurant ! Front of House manager is Byron Lowe – he has been working along with Chef Peter Hamm for the last two and a half years at a golf resort in North Carolina so they make a well established team. Chef Peter Hamm with me on the outside deck…. The whole site is very beautiful – the landscaping and stonework are particularly attractive and are done by local craftsmen. Sitting out on the shaded deck with a cool drink and something tasty in front of you – what more could you ask for !! Oh and I just remembered – I am delighted to see that they are using biodegradable cardboard boxes for take out leftovers – no more adding to the dreaded polystyrene mountain !